Barley straw is an interesting way to clear pond water naturally, and research supports its clarifying properties. A small amount of algae growth is normal in most bodies of water, and in low quantities it can actually be beneficial to ponds and fish! Algae may grow fast under the right conditions, but the majority of algae species are still plants, and plants provide oxygen, deplete excess nutrients, and provide water filtration. The problem with algae is when the weed is left to grow unchecked, it can lead to massive “blooms” which place a huge amount of stress on a ponds eco-system. As algae die and decompose, beneficial bacteria consume oxygen to break down the harmful substances they produce, which leads to lower oxygen for fish, and less efficient filtration as bacteria struggle to keep up with demands. Although there are effective mechanical (and chemical) ways to quickly get rid of algae, there has been a push to explore more natural methods to reduce costs, maintenance, and to prevent potential damage to the pond in the long run. Barley straw is at the front of that push! Even though barley cannot remove algae as fast as other treatments, it works as a great long-term control method and can help stop algae coming back in future, which is why it’s becoming more and more popular in the fish keeping hobby. As barley breaks down it forms substances that help control algae growth, such as hydrogen peroxide. 1) Barclay straw, or barley extract, is placed in the pond and slowly begins to decompose. During decomposition the cellular structure of the barley begins to break down, and the rate of breakdown is dependent on water temperature and oxygen content. Beneficial bacteria will work faster in warmer temperatures and well-aerated conditions, so you’ll see faster results from barley in summer compared to winter. After a few weeks in the pond, decomposition changes from being bacteria dominant to fungi dominant, leading to “rotting”. 2) As fungi eat away at the remains of the barley material, humic acid is produced, which is the first major step towards algae control. As the humic acids leech into the surrounding water it reacts with oxygen and sunlight, becoming more and more unstable and eventually forming a super-oxide radical which leads to hydrogen peroxide. 3) Hydrogen peroxide is a powerful algaecide, but when produced from correctly dosed barley it’s in a low enough concentration to be safe for fish and still work as an algae deterrent. A concentration of just 2 parts per million (ppm) is sufficient for controlling the growth of algae in ponds, and as hydrogen peroxide is more stable in fresh water compared to salt water, it stays effective for longer and requires less frequent dosing. Will barley get rid of my algae problem? Barley straw is a good preventive method, but should not be used for treat large algae blooms. The effectiveness of barley straw will depend on the amount of algae you have, the type of algae, and how quickly you want it gone! As with many natural methods of control, the turnaround to see results is often much slower in comparison to mechanical and chemical treatments. 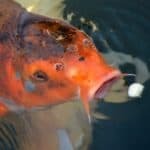 If you have a major algae bloom in your pond, and your fish are suffering, opting for a mechanical treatment (i.e., UV Clarifier) to resolve the problem and then using barley as a preventive method is usually the best way forward. In-fact, in most cases of algae growth, we would first recommend mechanical removal and a pond clean-up before adding barley to the system. Having large amounts of algae usually indicates excess nutrients, excess waste, or low-aerated conditions. Adding more organic material to the pond, such as barley, would only make the problem worse as it takes so long to become effective. As well as this, as barley straw is reliant on the beneficial bacteria in your pond to break it down, adding it to low oxygen and high waste systems will actually reduces its effectiveness, as bacteria are likely already struggling with the low oxygen content and large bio-load present. Barley straw works best in high-oxygen, well-aerated, and algae-free ponds as it’s free to decompose quickly and more efficiently. For this reason, we always recommend barley as a preventive measure, and not to stop a huge algae bloom already in place. The best way to use barley would be to first eliminate any major algae blooms, and then supplement with straw to prevent blooms coming back the following season. Are barley straw clarifiers safe for fish? Barclay straw in moderate doses is safe for fish, but higher doses can cause issues with water quality. If dosed moderately, and assuming your ponds water quality is good and there are no current algae blooms, barley straw should be perfectly fine for fish and plants. Even though barley decomposes to eventually form hydrogen peroxide, which is highly toxic, it will be in such low concentrations that fish won’t experience any negative effects. The main problems that can arise from using barley straw are drops in water quality, which are often caused by adding barley to a pond with low aeration, poor filtration, or high waste. Barley straw is carbon based and organic in nature; no different to leaves, twigs, and pollen which enters the pond and contributes to waste. Just like other organic material, during decomposition it will break down and produce harmful substances, such as ammonia, as a by-product. Beneficial bacteria would need to break this down or it can become a major issue for fish as concentrations rise. Adding barley straw to a pond which is already struggling with high waste problems would only amplify the issues, causing drops in oxygen and a rise in harmful substances. If your water quality tests are coming back as good, and you have adequate filtration and aeration in place, adding barley straw to prevent algae should be very safe for fish. It will also work much better as there will be more oxygen for bacteria (meaning faster decomposition), and less chance of problems with water condition later down the road. Barley Straw Vs Barley Extract (Liquid) – Which is better? Barley can come in a liquid formula which is more concentrated and faster to act compared to physical straw. When looking to purchase barley for ponds, you’ll likely come across two different products – barley straw and barley straw extract. Both of these work in a very similar way to prevent algae, but the delivery method is different, as well as the speed of action. In general, barley straw is considered more “natural” and works slower against algae as there is less surface area for bacteria to break down the material. The straw would first need to go through multiple steps of decomposition before hydrogen peroxide is produced. This process can take anywhere from 3 weeks, to over 3 months, depending on water temperature and pond conditions. Barley straw extract, on the other hand, comes in a highly concentrated liquid form and has been optimized for quicker turnaround. After you apply barley extract to the pond, beneficial bacteria will begin breaking it down much faster as it’s already optimized, leading to faster results. The main drawback of using extract over straw is that you need to be very careful with dosing, as the concentrated nature can make it very dangerous for fish. It is also more expensive than physical straw, and some treatments may contain additional chemicals to enhance it’s effects and increase its longevity. Both barley straw and barley liquid extract work similarly against algae, but since you should not be using barley as a “quick fix” anyway (see above), we’d usually recommend trying the cheaper and more natural physical straw. It may take longer to work, but it’s more cost effective and you’ll need to dose less as it releases substances at a more gradual rate compared to liquid formulas. Air pumps work well as aerators to supply large amounts of oxygen to pond water. Barley straw will only work while decomposing under well oxygenated conditions, and should be left as close to the surface water as possible (floating or shallow shelf) for the best results. It needs to be close to the surface so enough UV light from the sun can penetrate to form oxygen free radicals that eventually end up as dissolved hydrogen peroxide – the algaecide. When applying barley straw you want to make sure you have a stable aeration source, such as a fountain or air pump, as well as a filtration system to help remove some of the ammonia and nitrites that come with decomposition. If your barley treatment sinks, you’ll want to remove it and place it on a shallow shelf or consider a lighter product (We don’t recommend barley pellets, as most sink!). Dosage should be per manufacturers guidelines, so you’ll need to read the instructions on the individual product you purchase. Never use more than is recommended as this will place unnecessary stress on your biological filtration, with very little in turns of extra algae removal. If you have liquid barley extract, you should also dose as per the label guidelines. Dissolved extract has the advantage of remaining free-swimming and being in constant sunlight, and you should see results faster in comparison with barley straw. How long does barley straw take to work in ponds? Depending on the type of barley straw product you’re using, the quality of your filtration, and how much aeration you have in place, the full decomposition process usually lasts between 4 to 6 months. In warmer months decomposition will happen faster, and in colder months it will be a much slower process. This is because beneficial aerobic bacteria work more efficiently in summer and much slower in winter when the water temperature drops. Hydrogen peroxide will continue to be produced throughout the entire decomposition process, and will gradually leech into water over this period. You should start seeing results from physical barley straw from 2-6 weeks if treated in spring/summer, and 6-8 weeks if treated in autumn/winter. For barley liquid treatments, results will usually be slighter quicker and the concentration of hydrogen peroxide slightly higher. On average, you should start seeing results within 2-4 weeks during warmer months and 4-6 weeks in colder months. Remember, barley straw is a preventive method of algae control, not an algae killer, so a good result from barley treatment would be less algae returning the following year. To remove large algae blooms, always use a direct treatment method and only use barley to supplement the process. How often should you replace the straw in the pond? For the best results and algae prevention, adding more barley straw a few times a year is good practice to make sure there is always a low concentration of hydrogen peroxide in the water. To ensure there is always a little barley decomposing and producing hydrogen peroxide, we recommend replacing your straw every 4 to 6 months. How much barley straw are you dosing? Also, have you tested your water quality for further problems? Yep, that should be fine. In-fact, using the Crystal Clear (which is basically just beneficial bacteria) may actually improve your results from barley as there will be more available bacteria to help decompose the straw, resulting in a quicker turnaround of hydrogen peroxide to combat alage! Will the extract work in my three tier fountain? It may work somewhat in the long term, but the problem with barley extract is it requires bacteria for decomposition. There will be much less active bacteria present in a fountain compared to the bottom of a pond, so it likely won’t be anywhere near as effective. Hi! Can I use Barley Straw alongside Viresco Aqua without limiting the effectiveness of either product? I’m not exactly sure what Viresco Aqua contains, but it seems to be a natural beneficial bacteria supplement, so using it alongside barley may actually improve overall results (i.e., more bacteria = more efficient decomposition). It may be worth reaching out to Viresco to be sure, but personally, I don’t think there should be any problem. Someone said to ise hey straw . Will that work the same ? Most barley straw products intended for pond use have been treated and made safe for aquatic eco-systems. I’d advise against putting any kind of raw straw/grasses straight into a pond, especially if you’re unsure of the origins as it could contain pesticides, chemical residue, or bacteria. Also, when comparing different hays and straws, there is likely a different rate (and possibly mechanism) of decomposition, so I’d personally stick to barley straw products when it comes to pond-use as they’ve been tried and tested within the industry. Pond dyes will work to absorb a good chunk of UV light, so the effectiveness of barley may indeed be reduced. Whether barley straw would be considered effective in this situation would probably depend on the average depth of the pond, the concentration of water dye, and how much sunlight you get on a daily basis. The less dye, the more light, and the shallower the water (so more sunlight penetrates), the more effective the treatment. Would barley straw work in a pond that is indoors if the area gets only a small amount of sunlight? Could I ask what kind of algae you are dealing with? And how extensive is the growth? Without a good amount of sunlight hitting the pond, barley isn’t nearly as effective and results can be very slow. However, if you have enough light indoors for algae to grow, you should technically have enough for barley to work to some degree. I live in Ottawa, Canada, and close my pond for the winter (no fish), and bring all my supplies (fertilizer, beneficial bacteria etc.) into the house so it doesn’t freeze, and hopefully that also extends its useful life. Is there a ‘best-before’ for liquid Barley extract? Are there any specific products that start working in colder water so I can get the best start at prevent summer-heat blooms? Similar to straw products, liquid extract should last a long time if properly stored in a cool, dry, dark location. Even so, it would certainly have a “best before” of some kind, after which it slowly loses effectiveness. If the packaging does not have a date, you could contact the manufacturer to confirm, as the shelf-lives of products probably differ depending on the composition. It’s also recommended to begin running a UV clarifier in spring to remove any free-swimming algae particles before they can become too numerous in warmer weather. Is it safe to use Barley Straw in the plastic net that it was bought in? Is it safe for tadpoles and newts? Assuming you purchased barley straw intended for pond use, the net should indeed be safe. In regards to wildlife, unless you overdose with straw (which would lead to more waste/ammonia), it should not cause any problems for animals or the eco-system. I have a Koi pond with a few tench and goldfish, will the tench be okay with the bail barley straw option? As I know tench are quite sensitive? Yes, barley should be fine with tench. The problem isn’t the straw itself, but the amount of waste compounds (ammonia/nitrites) that would be produced during decomposition which has the potential to cause issues with water quality. The trick with dosing barley straw is to slowly dose over a long period, constantly monitoring water quality and seasonal algae blooms, until you’re able to get to a dosage that doesn’t interfere with quality but also slows down algae growth. This is why it’s always recommended as a long term algae solution, not a quick fix! Sorry I do have Koi as well and pond is 10,000 gallons. That’s a big lake! Unfortunately, although I take a great interest in all areas of aquaculture and water management, including lakes, much of my personal expertise lies primarily in much smaller ponds, so I don’t feel I’d be the best suited to advise here. If I were in your shoes, I’d consult a professional/company who specializes in lake management for guidance before moving forward, especially if I was unsure of the legalities of certain weed management techniques in the state/area (e.g., what herbicides are legal? what fish to consume weeds are native? are bottom aerators legal?). Assuming most weed management methods were legal in the area, and if having a professional on scene was not an option, I think the only way to manage such a large area of algae would be a mix of powerful aeration in the worst (usually stagnant) areas, aquatic algaecides to kill off the blooms, and then regular application of pond dyes to reduce future growth. I don’t think barley straw would be enough on it’s own, but may help alongside water dyes to reduce growth. If you use the lake to swim, you could also check into muck blowers which you can mount to docks to help keep a wide area free of algae, weeds, and bottom sludge. However, again, I’d certainly recommend consulting a lake professional, as they’ll be able to cater a solution to your specific situation after visiting the lake and investigating the problems hands-on. Best of luck with the lake! I hope you manage to get things sorted, and sorry I couldn’t be more help.